Digital! 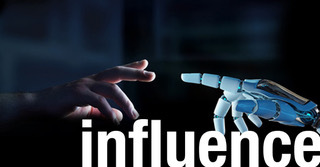 Enabler or influencing us: How human are our influencers? It’s the 4th Industrial Revolution. Artificial Intelligence and Machine Learning are here. With today’s information overload, even living in the moment is becoming a problem. Less than a decade ago, we were surprised when brands reached us on bulk-messaging services offering us products that we had recently shopped for. Now, most of us don’t bat an eyelid when we are showcased a product that our loved ones are using with the line, “You might be interested in this”, the ad copy featuring pictures of our friends. The advent of the faces of “known users” in our ads is slowly even negating the need for us to discuss the same with our loved ones. Today, over 65% of users use voice-based searches, which means greater use of products such as Amazon Echo and Google Home. So to speak, we are shifting from merely “typing our queries” to a more conversational format, with the difference that we are conversing with technological devices and not with each other. Tomorrow, these same devices might recommend us brands based on sponsored promotions. So today, as digital marketing induces us to make purchases “right now”, “add to our carts” – which most of the time seems to be based on what’s available rather than whether we really need it – we need to start asking ourselves who is really is the decision maker in making those purchases. Recently, the credibility of pseudo-celebrities in digital space as social media influencers seemed to be greater than that of real celebrities; there was a sense that these were real users influencing our purchasing decisions. And then, this happened! A month ago, I read about Bermuda and Miquela. They were in the middle of a digital fight, in which Bermuda threatened Miquela with revealing her true identity. For those not in the know, both are social media influencers engaged by brands to showcase products to huge numbers of online followers. Miquela has about 1.1m and Bermuda 65,000 followers on Instagram – and yes, I don’t think I mentioned that they are not real people. They are both CGI creations – Virtual Hyper-Realistic Humans influencing real people on social media. Of course, it’s morally dubious for AI creations to pose as influencers when they don’t consume products themselves – but more generally, what are the rules and regulations governing such influencing activity today? How different is AI or a hyper-realistic human or bot influencing our purchasing decisions from a series of custom-designed, story-telling ads written with a clear intent to trigger our emotions to make us “respond” in a pre-defined way? Millennials are travelling around the world making a name for themselves while their relatives live alone and far away, with high levels of dependency. A digital enabler in such cases could remotely order goods online for their dependents back home or easily ensure their safety with tracking tools. Imagine you are about to consume a sweet dessert from a fast-food joint and your wearable sensory tech device sends you a message reminding you of the dietary or health restrictions of your regime. You are running a marathon and are alerted that your heartbeat is elevated beyond your “usual high heart rate”. You lose consciousness, your pulse drops all of a sudden while you are alone travelling and your loved ones get an immediate update and a location map of where you are. An expert surgeon performing a heart operation from miles away using wireless and or remotely operated surgical equipments in real time at a location which it would be impossible for him or her to reach on time. But, today, unfortunately, data-driven insights, customer behaviour, buyer personas and the like are often simply integrated as aspects of corporate marketing strategies; and with exabytes of data at our disposal, many organisations use it to merely influence and induce our purchasing behaviours rather than improve and enhance our major life experiences. I remember Peter Drucker’s timeless advice: “The important and difficult job is never to find the right answer; it is to find the right question”. One thought on “Digital! Enabler or influencing us: How human are our influencers? Ananth, you have well echoed the maladies of hyper leveraged digital marketing in the name of personalized content and A I glitz. The questions raised around ethical dimensions have to be collectively addressed by the stake holders such as marketers, academics, anthropologists and civil society. I guess all digital marketers are struggling to find the obscure line that separates sanity from insanity in courting customers in digital space. While the digital infrastructure is being created at an ever faster rate with 5G roll out in the offing, one need to wait and see whether the promising thoughts around smart wearables, tele-presence driven robotic surgery and connected homes would stay free from the invasion of yet another wave of digital smothering!